BRYAN EATON/Staff Photo. 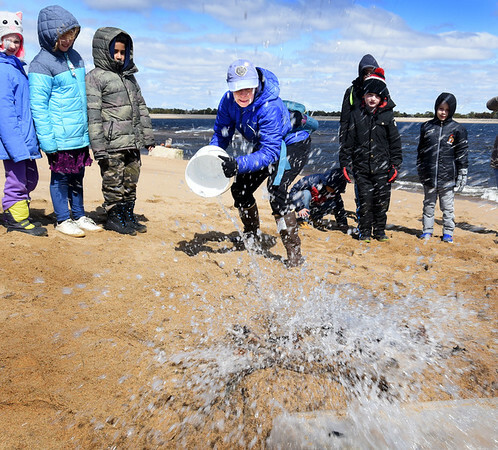 Johanna True from Mass Audubon's Joppa Flats Education Center throws a bucket of water, representing ocean waves, on a small sand dune second-graders from Burlington made and tried to reinforce with rocks and driftwood on the beach at Plum Island on Wednesday morning. In collaboration with the Burlington Science Center they were teaching the youngsters about the vulnerability of barrier beaches with the forces of wind and tides and they also planted dune grass which retains sand from being washed away.